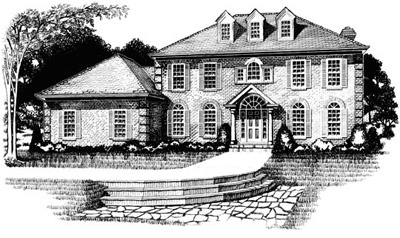 Cesario Builders, a custom home builder located in Warrenville, Illinois, required a line illustration of their new Windemere model home for sales and marketing brochures and newspaper advertising. To complete this project, Randal Birkey first created a 3D wireframe model of the home, based on the builder’s blueprint drawings. Once the wireframe viewpoint was approved, the linework was placed in a typical residential lot setting using landscaping and construction material information as supplied by the builder. The final art was developed as a digital illustration in Adobe Photoshop and delivered via email to the client.